A Jacksonville woman will face criminal charges after police allege that she used two children to assist with shoplifting from a Dillard’s department store at an area mall, News 4 JAX reports. Officers made the arrest after the woman was caught on video surveillance as she entered the store and headed straight to the purse section, accompanied by the minors. She handed three luxury brand handbags to the children and gestured for them to follow her, and then the trio attempted to walk out of the store without paying. The accused faces charges of grand theft, which is one of many theft crimes in Florida that focus on the value of the items taken when issuing a sentence. 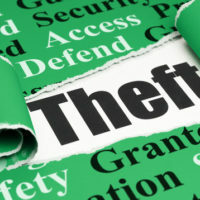 In general, theft charges apply if you unlawfully take property from another person or entity with the intent to deprive the owner of using the item – instead appropriating the property for your own use. The crime is grand theft when the total value of the property exceeds $300, but the degrees of the offense vary as that amount increases. Third Degree Grand Theft is a case where the property is worth $300-$20,000 OR if the item is a will, a gun, or a motor vehicle. A judge may issue a sentence of five year in prison, five years on probation, and a maximum fine up to $5,000. Second Degree Grand Theft charges apply if the property is valued at $20,000-$100,000 OR if the stolen items include certain minimum values of shipping cargo or medical equipment. You may be sentenced to fifteen years’ incarceration, fifteen years on probation, and a fine up to $10,000. First Degree Grand Theft includes stealing property worth $100,000 or more, or if the crime involves shipping cargo worth more than $50,000. For a conviction, you’re facing a mandatory minimum sentence of 21 months and a maximum up to 30 years in prison. Plus, you could be sentenced to 30 years on probation and a maximum fine of $10,000. In some cases, a conviction for grand theft may lead to a suspension of your Florida driver’s license – regardless of whether you used a motor vehicle in any way during commission of the crime. A court is required by law to suspend the driving privileges of a repeat offender, even if the previous crime occurred in another state. If you’ve been charged with grand theft under Florida law, you’re probably aware that you could face jail time, probation, and hefty fines; however, you might not know that a conviction may also result in a loss of your driving privileges, which can have a severe impact on your professional life, family, and personal freedoms. A knowledgeable criminal defense lawyer can help protect your interests by attacking the charges against you and mounting a strong defense, helping you to obtain the best possible outcome. For more information on grand theft crimes, please contact the Fort Lauderdale offices of attorney Kevin J. Kulik.